Fox International Tackle is firmly established in the carp fishing market place and here at Wirral Angling Centre we have their full range available to us. Powered and Supplied 2 x AA batteries. Powered and supplied with 2 x aa batteries. Powered by 3 x aa rechargeable batteries. The Warrior Micron offers styling, performance and features that far exceed the extraordinary low price. only £24-99 batteries not inc .available in the shop. Micron M2, Build,s on the reputation of the Micron updated to include the latest digital circuitry. volume, tone and sensitivity setting all of which have 8 different setting,s. 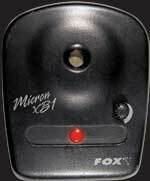 Micron EOS is the new generation of fox alarms developed over 3 years they are compact, stylish and built ro und a weather proof casing. 3 x STR Hard cases. The TXR plus digital system transforms your microns into a remote system it incorporates a TXR transmitter unit and a TXR receiver to take up to 4 alarms of any make that have a 2.5mm or 3.5mm output socket. The transmitter is designed to fit on the buzz bars with the adjacent alarms plugged in to it. The receiver can detect signals from 500 yd's away, both units have digital circuitry and protective electronic,s in a waterproof case, comes with all leads, charger, buzz bar attachment , in car charger, colored interchangeable lens,belt clip, and stand. XB1 Extension box is compatible with all alarms which use 2.5mm extension socket,when used Micron M Alarms you will need Micron M Leads. volume control,high output speaker,latching led,4 imput sockets,low battery drain.-lso available XB4 Extension box,comes with 4 latching led,s £34-99. 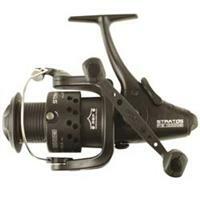 STRATOS FS 1200 MAG REELS WITH FREESPOOL FACILITY. FEATURES, INCLUDE. Front Clutch grit guard to ensure dirt can,t penetrate internal components. Gear ratio 4.2.1 for the 1200fs model. Knot recess in the spool. Sure grip soft touch fitting. Free spool fs model only. 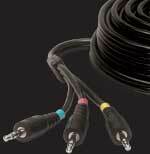 Supa-slow oscillation for perfect line lay. The Stratos FS7000 is identical to the FS10000 but is an 84& scaling of its big brother. It is suited to Barbel and specialist anglers or small water carp fishing with lighter lines. Approximately an 84% scaling of the 10000, this neat, compact reel is designed primarily for smaller waters, controller fishing or specimen barbel and tench. Features 9 ball bearings and comes complete with a spare spool. 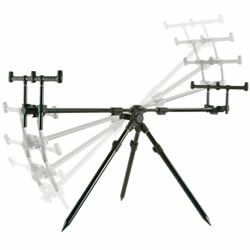 The Fox Sky Pod has elevated rod pod design to another dimension. Specifically designed for large Continental rivers and lakes, the Sky Pod is so flexible it is still at home on the banks of a traditional English carp lake. The Sky Pod can be adjusted from below the horizontal plane to literally pointing skywards allowing you to get over any snags often found on big European waters. Designed for European waters, the new Ranger is the ultimate in pod technology and utilises ideas from some of the world’s best anglers. As you can see, the Ranger can be used in a plethora of positions to cope with the most uneven bankside terrain. Its chunky dual frame design, durable fittings and numerous leg length options make it the pod of choice for anglers who like to target extreme venues. Staggered buzz bar fitting enables free movement of indicators without colliding with banksticks. Supplied with deluxe bag and buzz bars. As you can see from the pictures, the Eclipse is one of the most versatile and easily-adjusted pods available, suited to all styles of carp fishing – either on large continental venues or smaller, UK carp waters. The Eclipse is based around a central tripod system which allows the pod to be positioned pointing up or down in a matter of seconds. A central Quick Release lever allows these adjustments to be made with ease. Like all Fox pods, it’s ultra stable too with quick-release fittings to make it extremely user-friendly. The Fox Horizon Pod – has been designed for those anglers who prefer a snag bar or `goal post’ style set up but with the flexibility and stability of a pod. Undoubtedly this is one of the most stable set ups around making this an essential piece of kit when fishing at long range or on those rock hard banks, where the use of banksticks is just not practical. The Horizon Pod is supplied with a pair of 3-rod buzz bars and can be adjusted from a horizontal plane to a pitched plane, allowing the rod tips to be raised so you can get over bank side snags or awkward obstructions. The centre body can be adjusted in length to give greater stability and to accommodate different rod lengths. The uniquely shaped aluminum on which the Horizon Pod has been built guarantees there is not a hint of wobble in the set up. It also ensures perfect alignment of Microns and rod rests. For all this stability you would expect the Horizon Pod to be incredibly heavy but with this very unique design we have been able to keep the weight to a minimum to allow for easy transportation. The Stalker Pod has been designed for those anglers who prefer a snag bar or `goal post’ style set up but with the flexibility and stability of a pod. The Stalker Pod is supplied with a pair of 3rod buzz bars and can be fully adjusted via the center body to suit different rod lengths. Undoubtedly this is a most stable set up making this an essential piece of kit when fishing at long range or on those rock hard banks, where the use of banksticks is just not practical. The uniquely shaped aluminum on which the Stalker Pod has been built guarantees there is not a hint of wobble in the set up. It also ensures perfect alignment of Microns and rod rests. For all this stability you would expect the Stalker Pod to be incredibly heavy but with this very unique design we have been able to keep the weight to a minimum to allow for easy transportation. The Trek is a totally new pod concept that is super lightweight and incredibly compact. The Trek operates via a central hub which houses each of the four legs and these are locked into position using the cam locking lever. Solid, portable, sturdy and reliable, the Trek is poised to set new standards in pod design. Trek Pod, leg retaining clasp, front and rear buzz bars, 4 x banksticks and locking key. To assemble, unlock the cam lever on the central hub and unclip the legs from the retaining clasp. The legs open up and then splay outwards to give stability. The legs are locked by closing the central cam. Screw lock system allows for correct and secure alignment of rod rests and alarms. Each bankstick attaches to the screw threads on the underside of the buzz bars. The banksticks secure neatly into the Trek sockets via a locking cam, creating a super solid and sturdy set up. The X-Pod is destined to be one of the biggest products that Fox have ever launched, thanks to its unique design and stunning simplicity. Based on a similar principle to the Quattro Pod, the 'X' is designed for use with 'goalpost' style buzzer bar set-ups for improved stability. Four arms meet in the centre, around a boss, creating the characteristic 'X' that gives the pod its name. The legs fold around the boss, making the pod almost impossibly compact when folded away and so quick to assemble that you'll miss the operation if you blink! Because the legs all meet in the middle, the pod will not twist when you pick it up, with three rods in tow and move your whole set-up to another swim! 3 Rod Buzz bars are included in the price, making the 'X' almost too good to be true! The A Pod has been designed for those anglers who prefer a snag bar or `goal post’ style set up but with the flexibility and stability of a pod. 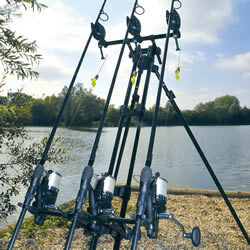 The A Pod is supplied with a pair of moulded 3rod buzz bars and has a fixed body measuring 910mm. The design allows the pod to be packed away either by unscrewing each leg and removing the buzz bars or by removing the whole end assembly so that the legs and buzz bars are all attached. The uniquely shaped aluminum on which the A Pod has been built guarantees there is not a hint of wobble in the set up. It also ensures perfect alignment of Microns and rod rests.